Once again, Marc Jacobs has recruited an unexpected person and has looked to the trans community for one of the faces of his brand and to front campaigns. Director Lana Wachowski is a new face of Marc Jacobs for the Spring/Summer 2016 campaign. If Wachowski's name is not instantly familiar to you, well, let me remind you how you actually know her. Wachowski, 50, is one of the co-directors of the The Matrix. She directed the film and its sequels alongside her brother Andy. Early in her career, she went by her given name of "Larry Wachowski" and the duo was known as "The Wachowski Brothers." The siblings also wrote V for Vendetta and if you're not a comic book fan, well, you might remember that's the movie for which Natalie Portman shaved her head. Wachowski has since transitioned. She had been presenting as a woman since 2002 but publicly came out about her transition in 2012. Jacobs confessed in the caption that "this season's ad campaign represents a series of connected events; a visual narrative. It is a personal diary of people who have and continue to inspire me and open my mind to different ways of seeing and thinking." The designer also stated that he wants the models in his latest campaign to "embody and celebrate the spirit and beauty of equality." Wachowski certainly oozes spirit and beauty in her first ad, rocking a blue plaid dress, a granny chic cardi, and her blonde bobbed dreads, which boast pops of color. She looks adorable with her arms outstretched and her eyes wide with wonder! I suggest you take a second to read the entirety of Jacobs' explanation about how he met Wachowski and why he chose her. Having Wachowski rep his Spring/Summer range is critically important because a major designer is using his power and pull to speak to a specific community and to further open the world's eyes. That's a beautiful thing. Wachowski is not as high profile as, say, Caitlyn Jenner, but more people need to know who she is! The ad can remind those who've yet to transition that they, too, have hope! It's also important because Jacobs continues to choose people of all age groups to rep his brand, like Wynona Ryder, who is 44. Wachowski is 50. It's a groundbreaking and "it's about time" move to eschew the usual twentysomethings to spotlight other demographics. The ensemble in her first ad certainly nods to her signature style! 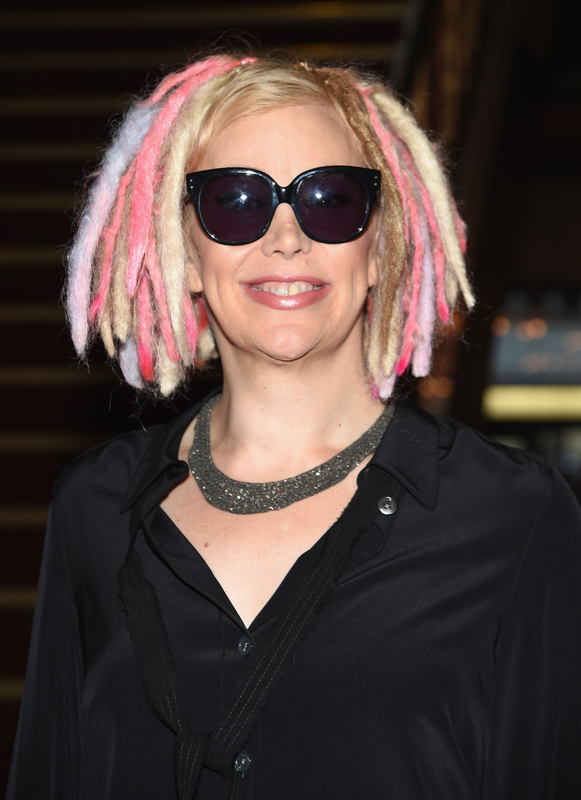 Wachowski surely knows how to rock the dress/cardi/dreads look! You're getting a sense of her signatures, aren't you? Wachowski seems to be super lively, with her look and her posture. Her Marc Jacobs ad projects a serious sense of wonder, as do most of these pics. Jacobs shared a shot of a hang sesh with Wachowski a few weeks ago. Clearly, he is selecting people he feels a strong connection with to front various arms of his brand. Like his BFF Winona Ryder!